French-Country fireplace mantels are currently enjoying a revival in popularity, thanks to a renewed interest in clean designs and delicate details. These fireplace mantels suit a variety of design schemes and decors without overwhelming the visitor with details. SoCal Fireplace Mantels is your leading provider for French-Country fireplace mantels in Los Angeles because of our wide selection of designs and the variety of natural and cast stone options for creating your perfect French-Country fireplace mantel. French-Country fireplace mantels are unique among the many designs that we offer here at SoCal Fireplace Mantels because of their detail and clean, classic look. French-Country fireplace mantels feature delicate details such as small vines and flowers, shells, wreaths, or smooth, flowing lines. Although these designs have an extraordinary amount of fine details, they present a clean look that is never too busy or overdone. SoCal Fireplace Mantels is your premiere Los Angeles French-Country fireplace mantels provider because of the number of elegant designs that we offer. 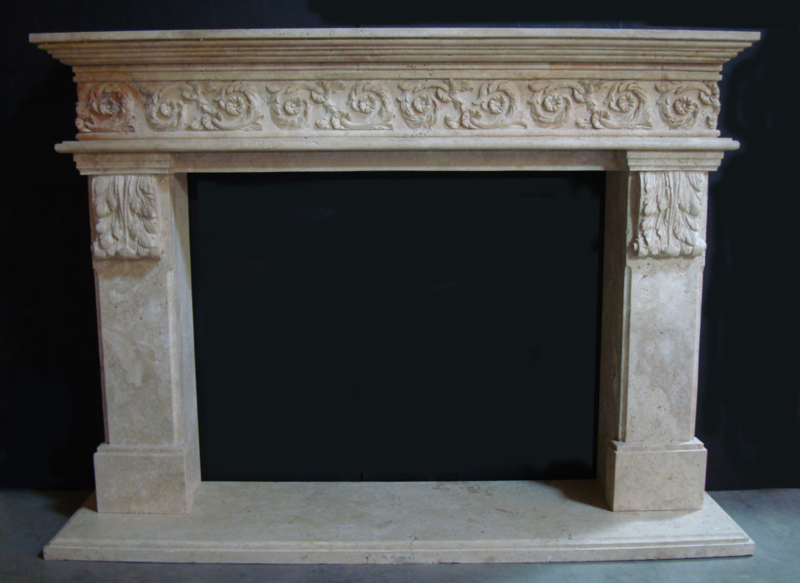 Although French-Country fireplace mantels can be made from any color material, they are typically carved in a light colored material, such as the traditional stark white marble, yellow marble, green marble, travertine, or a light-colored cast stone. Choose the medium that most appeals to you and best suits the design and the décor of your home. SoCal Fireplace Mantels is your first choice as a provider for French Country fireplace mantels in Los Angeles, Orange County and Ventura County, because of the wide variety of options available. However, if nothing that we have quite suits your needs, we are happy to work with you to create a custom French-Country fireplace mantel that is designed specifically for your tastes as well as for the décor of your home or business. Come visit our spacious showroom in Van Nuys and find out why SoCal Fireplace Mantels is the premiere Los Angeles French Country fireplace mantels provider. Our professional and highly trained sales associates will be glad to show you our many French Country fireplace mantel designs and help you order the one that best fits your needs, or to get you started on creating a custom French-Country fireplace mantel created just for you.